The Sunday Age City2Sea presented by Westpac took place this morning in the streets of Melbourne. With overcast conditions and basically no wind, runners from around the globe flocked to the iconic MCG in a hope to achieve their goals. First up was the 5km Wheelchair race where all eyes turned to Richard Colman who eventually took out victory in the race. Next up, was the 5km race and young gun Kurt Fryer took out the victory, followed by Sam Macaulay and Dean Ryan in third. In the women’s, Kate Seibold took out the victory with Sarah Walker in second and Millz Whishaw in third place. You can see the top ten male and female competitors below. Once most of the 5km competitors had crossed the finish line, all eyes turned back to the gates of the MCG for the start of the 15km City2Sea. A strong field of both males and females awaited the 8.20am start time. Commonwealth Games Marathon runner and Adidas athlete Liam Adams was too strong for the rest of the field, crossing the line first in a time of 44:34. He was followed by Saucony athlete Steve Kelly, who finished in 45:05. Brooks runner Stephen Dinneen rounded out the top three with a time of 45:13. In the women’s it was Makda Haji who took out the victory, crossing the line in 50:55. Tarli Bird came in behind her, with a 53:15 and Melanie Panayiotou finished in third with a time of 53:46. 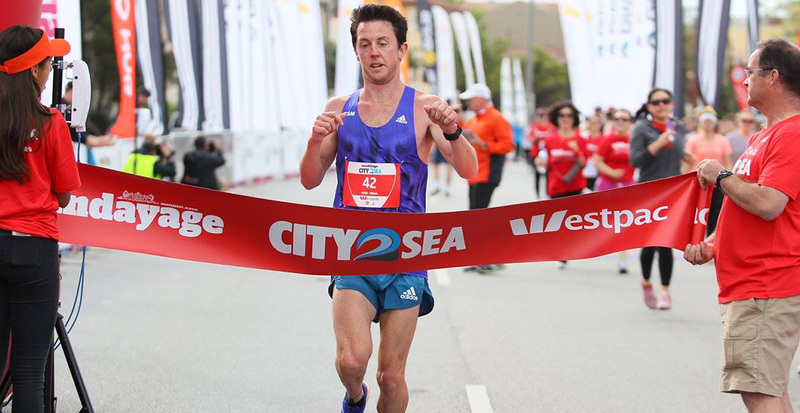 You can view all the results from this mornings City2Sea by clicking HERE.